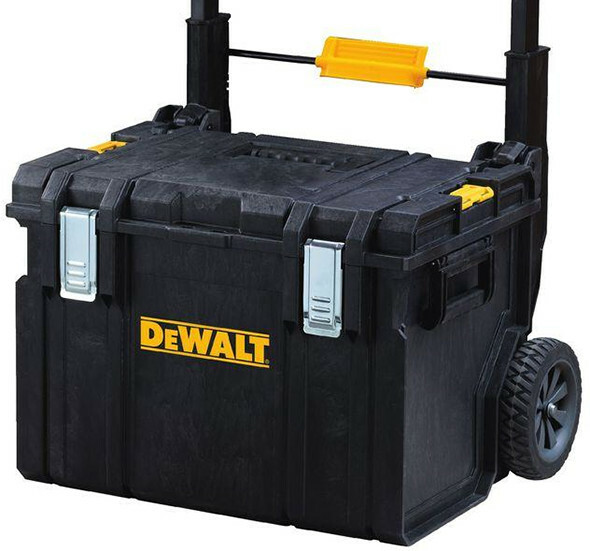 Over at Acme tools, they have the Dewalt ToughSystem tool box on sale for as low as I have ever seen it, as part of their Black Friday 2018 promo. It’s on sale $25, which is HALF what it usually sells for. Not only that, you get a free Dewalt LED headlamp (200 lumens, 3xAAA) with your purchase. So that’s a tool box and ~$20-valued LED headlamp, for $20. In addition to the special pricing, the ToughSystem tool box is also eligible for Acme Tools’ $25 off $100+ select Dewalt tools coupon promo. So, if you order it as part of a larger order of other eligible items, you get the discount AND the free headlamp! Update: There’s a limit of 2 per person! Deal ends 11/30/18, unless supplies sell out sooner. This plus at Home Depot 98$ kit and $45 large size are the best ways to build out your tough system kit if that’s your thing. I saw that the other day after someone brought it up, but it seems to be a mistake, bundle price, or past deal, since it’s not available for sale for in-store pickup or shipping. There’s no way to actually buy it. I had already bought 3 + tote + tote with handle at acme for $100 + a free headlamp! They must have their promotion stuff backwards. It says tstak promotion but shows all of the toughsystem equipment. This whole toughsystem and tstak’s are confusing. They aren’t interchangeable correct? Are they both still supported by Dewalt with new products coming out? I have invested into the tough system and just want to make sure they’re still coming out with more product. Milwaukee seems to have the jump with the Packout because they have soft totes, to small organizers and everything in between but is a lot more expensive. Tstaks are smaller, ToughSystem are larger and made of tougher materials. Yes, they’re both current and actively supported lines. New ToughSystem drawer boxes should have come out recently, I haven’t seen them yet. Craftsman VersaStack is TStack compatible. Thanks for the reply Stuart! May have to look into both options now! I love some tstak stuff and love the toughsystem. Just a fyi Amazon had the clear organizer for about 18 a few weeks ago. Where are the racks?? I placed my order on acme for the toughsystem, extra Phillips bit to make the $100 Dewalt deal for $25 off of $100. Received a Black Friday continuation email from acme and noticed they have a limit 2 on each case. I wonder if they’re going to cancel my order now that there’s a limit. Is this something they added a restriction on or did everyone else notice the limit 2 per customer? I just saw that in their email newsletter too. Maybe that was a rolling change? I didn’t see anything on the website, and I still don’t. Definitely posted on the website and never noticed at all when on the website earlier. It’s clearly visible now so I believe it’s a rolling change with everyone ordering 4 like what you said here. Hopefully they still honor my order. Looking at the flyer and squinting, it says “limit of 1 per person.” Hmm. I didn’t mean to encourage the buying of multiples, I was just testing to make sure the $25 off $100+ promo worked, and testing it on several of an item is easier than testing several permutations. Reworking that part of the post now. Ah, I see a mention now, at the top of the page. “Limited to stock on hand. 2 per customer.” I believe this is a recent addition because some of the other deals have been selling out. Maybe it’s to discourage resellers? The headlamp offer was listed free if you buy 4, when I ordered last night. Added filler to get to 100 to get to the 25 off. I used the $25 off to pick up one of the Dewalt ToughSystem coolers. Already on sale for $120 – $25 = $95 shipped. I know there are better coolers out there, but none that I can stack with my existing tool boxes. Saves room and keeps things more stable in the truck bed. Check the fine print for the free headlamp promo- need to buy 4 qualifying boxes (small, medium, large box, tote w/o handle, and/or clear organizer) to get it. Until I noticed this, I was wondering why there was no headlamp when I added the small box to the cart. I see that now too. I’d swear that when I tested the promo I added (1) box and the headlamp appeared in the cart, but there’s no way to go back and check. 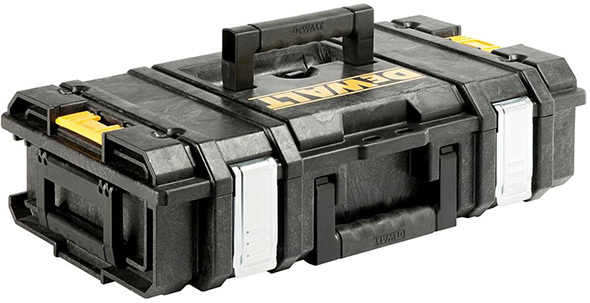 The DEWALT DWST08203H Tough System Case, Large at Acme is $59.99 (on sale) but on Amazon it’s $45.00 . I have really never found much of a reason to shop Acme. Like anything else, go with the deals. Yup, I only used Acme in this case to get 4 of the smaller cases and a Phillips bit as a filler for the $25 off a hundred, free headlamp. I go where the deals lead me. It was also on sale Friday-Saturday at Fleet Farm for 30 something. The ad showed the full cart, but the small print indicated individual pricing of each. I chatted with HD bilberry and they said the $18 is the regular price. More inventory expected in mid to end of Dec. I’m not sure I really believe that is the regular price of the 150 box but I’ll keep checking in case. I chatted with HD on line and they (or the bot) said the $18 is the regular price. More inventory expected in mid to end of Dec. I’m not sure I really believe that is the regular price of the 150 box, but I’ll keep checking in case. Looks like the price went back up to $49.99 before 11/30. That can happen if supplies are limited. I’ve had deals cancelled in February or March before, because a retailer sold so many they couldn’t fulfill the orders. Stuart, they fulfilled my order, and just received it yesterday. (all 4). There’s another box, which I assume is the free lamp! I was told they would fulfilled reasonable customer orders, and that the limit was more to thwart blatant resellers. When did you order yours? I haven’t received any notices or anything in regards to my order and I did the same thing you did Rick. I finally got a message from Acme on my order. They delayed shipping it because their Phillips bit that I used to fill in for the $100 total is backordered. They’re going to finally ship the rest of my order Monday. All because of a tiny Phillips bit on backorder. I finally got the DS150 from HD. It has a bunch of the yellow boxes and is about the same size as the more expensive DS130. I had to watch the HD app to see when it is available again. I saw it but took too long then it appeared again two days later. The DS150 @ $18 is a really good deal compared to $35 or $45 standard for the DS130. This has the extra handles and weight capacity too. Seems that the main challenge is finding them in stock. I’m looking for ideas how to mount them in the garage without spending $17 for the handles. I definitely think a home made mounting bracket option would be fairly easy. I’ll be experimenting as well on a home made rack system. I’d love to see some plans using just wood. I agree it shouldn’t be too hard. It would be great if there were some dimensions to follow, especially the brackets they have for sale. I think you can base the sizing off of the handles on the sides of the toughsystem. I’m thinking solid wood for the back rack and dadoing out where the glides will be so it’s nice and solid.